A leading global pharmaceutical company needed a better understanding of Nurse Practitioner (NP) and Physician Assistant (PA) over the counter (OTC) prescribing behavior. The company asked RNsights to survey NPs and PAs about their prescribing frequency with the goal of gaining actionable intelligence about the level of involvement of NPs & PAs in OTC prescribing and the best ways to provide OTC product education. 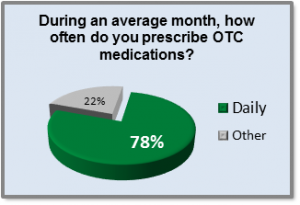 RNsights helped develop surveys including questions about frequency of prescribing certain OTC medications and which tools could help healthcare professionals distinguish the differences between competing OTC medications. RNsights distributed the survey to the target NPs and PAs in appropriate specialties and aided in evaluating the results. RNsights delivered survey results within three days from nationwide respondents providing detailed evidence of the percentage of NPs and PAs who stated they would benefit from more information about certain OTC products. The large multinational pharmaceutical company used the valuable insights they learned about the OTC products most often prescribed daily by NPs and PAs in order to tailor their marketing plan for this target market segment. Additionally, the pharmaceutical company’s marketers used the survey results to better understand the best methods to reach and inform their target NPs and PAs so they could make evidenced based decisions about future ways to market their products.